This article is a breakdown of how to set up the payment timings using payment schedule as well as how to change the total down payment that you require your clients to pay through one of your payment gateways. This section is for when you are handling long term rentals. This will help you to schedule when you will charge your clients the rental price either by day, week or month. Firstly, navigate to Settings > Fleets > Company Brands highlighted in dark blue in the picture below. Next, click on your company brand. Then navigate to the Payment Schedule tab highlighted in orange in the picture below. In this tab, there is two sections “Schedule After Pickup” and “Schedule Before Pickup” shown in the picture below. The difference between “After Pickup” and “Before Pickup” is when you charge the payment to the customer. After Pickup is when you would charge your customer after they have picked up the vehicle from your office. Before Pickup is when you would charge your customer before they pick up the vehicle from your office. You can hover over any of the “Question Mark” tips to find out more information about the respective labels. 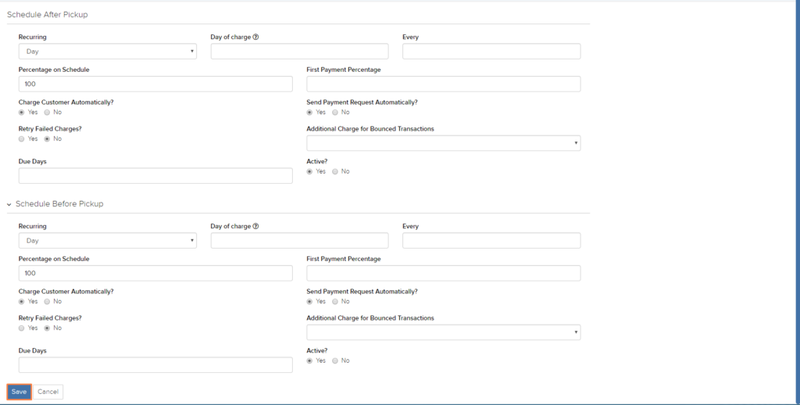 Make sure to select which payment schedule is active by ticking the radio button under the “Active?” label. Once you are done setting up the payment schedule, click on the blue “Save” button highlighted in orange in the picture below. This section is for when you want your customers to pay a certain percentage when confirming their reservation/booking. Firstly, navigate to Settings > Car Rental > Online Charges tab highlighted in dark blue and orange in the picture below. This tab manages how online charges are made when a customer does a reservation through your website. Here, key in the down payment percentage that you would like to charge your customer in the “Percentage to charge in online bookings” label highlighted in orange in the picture below. 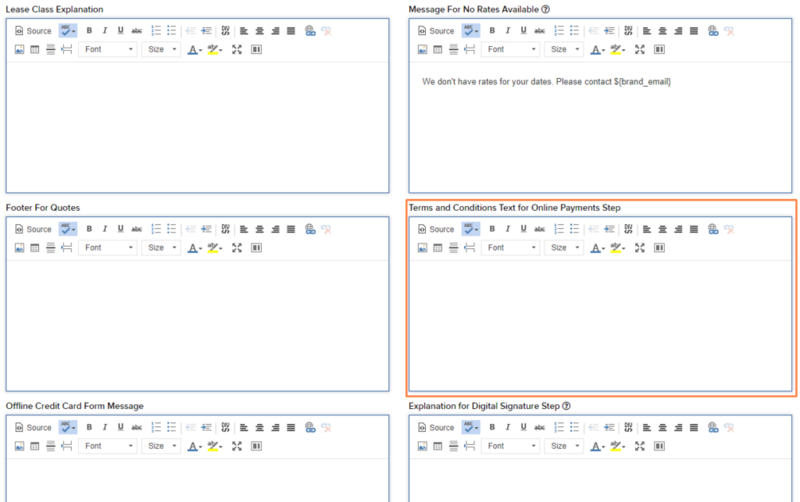 You can hover over the “Question Mark” tips for more information about the respective labels. You can let your customers know that you will be charging a certain percentage of down payment by heading to Settings > Car Rental > Text Settings section > Terms and Conditions Text for Online Payments Step highlighted in orange in the picture below. To learn how to add a payment gateway for online charges, click on this link here.